For one, fly wider circles, up to a point. Here's how to find the balance. Arriving at the airport for the visual part of a circle-to-land approach requires you to remember that you're flying a VFR traffic pattern while doing it differently than you normally would, for some good reasons. Circle-to-land approaches get a bad rap. Granted, they earned it by breaking a bunch of aircraft, and they can lure the unprepared out of bounds in an eye-blink. Yet to say, “I never circle-to-land ...” can be just as dangerous as going cavalier because circling approaches aren’t one-size-fits-all. Best case, a circling approach is essentially ending your instrument approach by flying a traffic pattern to the runway of your choice. 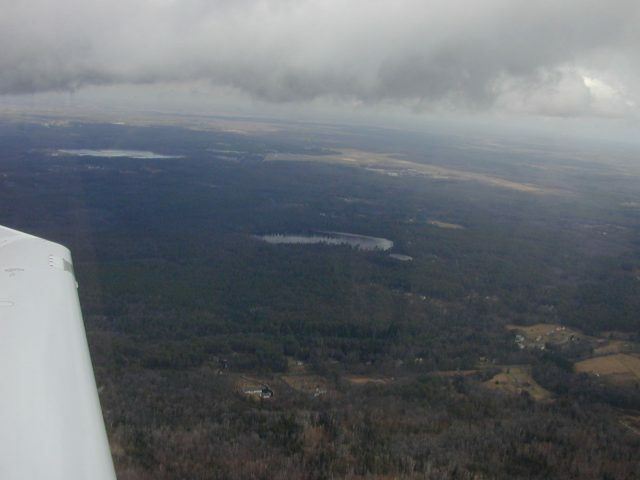 We don’t think of joining the downwind in visual conditions as circling, but it is. Few people would call that an inherently a risky maneuver. Of course, conditions may dictate flying the “pattern” lower than normal—potentially within 300 of the ground. (Well, within 300 feet of the highest obstacle, but you get the idea.) This could be done in low visibility. It could, in some cases, be done at night. Planning is critical both for situational awareness and because the approach chart or Chart Supplement may restrict which patterns are available for which runways. On the approach chart, the restriction should appear in the notes. You might see, “Circling North of runway 09-27 NA,” or “Circling NA at Night.” You also must respect the standard traffic pattern for each runway. If the Chart Supplement says it’s right traffic for runway 27, you must plan your circling for right traffic. An instruction from ATC at a tower would override that, but at non-towered airports, it’s a restriction the FAA has come down on pilots for breaking. The takeaway from all of this is that you maximize your odds of success by planning the transition from the safety of the final approach course to the safety of at least some part of the normal traffic pattern. Your circling minimums define the safe area that allows that transition. If the ceilings are overcast at 1100 AGL and the circling minimums are 450 AGL, you don’t descend to 450 and fly a pattern. You level off at pattern altitude and fly the pattern as normally as you can. From the downwind on, this is a normal pattern to land. This presumes enough visibility to fly that pattern and no shreddy bits hanging down from the clouds you must avoid. When ceilings drop below pattern altitude and visibility is restricted, the goal is still to rejoin an otherwise normal pattern already in progress. Suppose the ceiling was 500 AGL with a circling minimum descent altitude (MDA) of 450 AGL. You’d fly a downwind at 500 feet, base at 500 feet, and turn final at 500 feet before joining the normal approach angle to land. But you’ve reestablished normality on final. There’s a trap here. Any time you fly a traffic pattern lower than normal, you must either fly a wider pattern to end up with a normal position and speed on final. The vertical distance you lose in a normal traffic pattern sheds energy and is part of your space for turning. The effect is subtle and non-intuitive, but it leads to an overshoot of final if you don’t expect it. Fear of flying outside the circling area tends to keep pilots unnecessarily close to the runway—exactly the opposite of what needs to happen to join a normal pattern at some point. A common (and too often fatal) circling error is flying a close-in turn and then adding a steep descent to join a really short final. Better to fly far enough away from the runway to make a level turn so you can line up with the landing runway first—while still at or above circling minimums—and then descend for landing as you intercept a normal short final. That’s not always possible, especially as you get down near MDA for your approach category. Bear with me as I haul out some math. Start with the safe area and circling radii. The safe area extends a certain distance from all edges of the runway surfaces. The distance gets longer for aircraft that fly the approach faster. The slowest is Category A, which fly no faster than 90 knots while circling and may have a safe space reaching only 1.3 nm from the runway. Category D aircraft can circle at 165 knots, but their safe area extends at least 2.3 miles to allow for a bigger turn radius. Let’s assume you fly approaches at 100 knots and will start your circle from that speed. You use Cat B minimums and have an area to maneuver that extends 1.5 miles (or more, see sidebar) from the runway. That’s wider than most of us fly GA traffic patterns. For 100 knots true airspeed and 15 degrees of bank, the diameter for a 180-degree turn would be 1.2 nm. But there’s a complication. 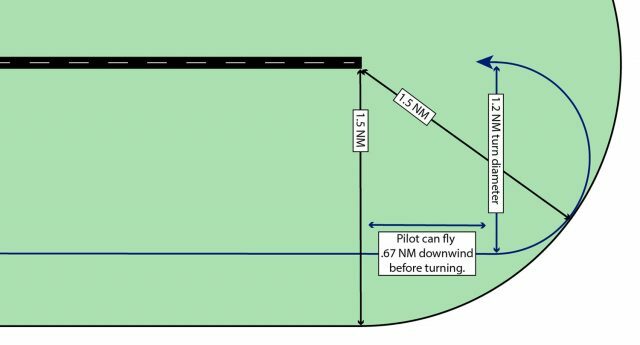 If you fly 1.2 miles from the runway on downwind and then started that turn just abeam the numbers and at our hypothetical MDA of 500 feet, you end the turn over the threshold 500 feet above the runway. That is not exactly a normal landing. If instead you fly at 500 feet AGL far enough away from the airport to intercept a three-degree approach to landing, you’ll be at 500 feet about 1.4 miles from the runway threshold. That sounds within Cat B minimums, but it doesn’t account for the turn radius you need to line up on that final. You’ll actually exceed the safe area by more than half a mile if you try that stunt. However, a standard GA pattern has a descent angle of 4.5 or 5 degrees. That puts you about a half mile from the threshold. It’s possible to circle and end up in this position. When you look at a downwind 1.2 miles from the runway and a turn at 100 knots and 15 degrees of bank, you can start that turn as late as 0.67 miles past the threshold and just barely stay inside the protected airspace. If it’s a long runway or there’s a headwind on final, that’s in your favor. If the MDA was 350 feet AGL, you have less altitude to lose, so the final descent isn’t that steep. If the MDA is higher or the runway is wet and short? This might not end well. I can hear you asking, “1.2 miles for the downwind? 0.67 miles past the threshold? Hold on while I break out my aviation micrometer.” Fair enough, but that GPS in your panel can be just the tool in this case. To offset 1.2 miles from the approach course, fly until you see a 1.2 nm cross-track error. Know the length of the runway and still have a distance shown to the missed approach waypoint (MAP)? You can know when you’re 0.6 miles past the landing runway. It just takes some forethought. The direction and velocity of the wind, the type of plane you're flying and even the length of the runway are important considerations when planning your pattern speeds, turns and descents. Circling doesn’t always involve a turn. This downwind situation is really the worst-case scenario. The most common reason for circling to land is that the runway aligned with the approach isn’t aligned with the winds or isn’t available for landing, or that there’s no runway at all aligned with the final approach course. Some kind of pattern is required in this situation, but it might just be a base leg and final. This means fewer degrees of turn and can be done in a smaller radius. However, it’s still ideal to use more of the circling area, so you can maneuver horizontally first to line up for an aligned descent. Sometimes the approach aligns with the runway you want, but only circling minimums are published. In this case, either the descent angle from MDA to the runway is excessive or the runway environment lacks enough visual aids, such as paint, lights or even parallel taxiways that help you find it visually. You don’t have to overfly the runway and come back on a downwind. You can land straight in from circling minimums if you can make a normal descent to the runway. Just know it may be a steep angle and hard to see when conditions get near minimums. The wind can make a huge difference in how hard that descent is in practice. Speaking of wind, presumably you’re circling to land into the wind, so at least part of your maneuver will be with a tailwind. If that tailwind is on a downwind to your landing runway, ensure you start your turn back to final early enough that you don’t exceed the circling distance while you have the extra groundspeed. The turn back to the airport will slow everything down to your advantage and steepen your effective descent angle. If you’re working a crosswind, strive to turn such that you’ll head into the wind as you head for final. You’ll have to watch out while you have a tailwind as always, but the latter part of the turn is into the wind and slows your closure on final with the nose already in the direction of the crab down final. The takeaway from all of this is that you can improve your circling safety by planning for each situation and specific approach. You might end up using an approach category higher than technically applicable for your aircraft to get the lateral distances you want. But that’s better than getting disoriented, overbanked, or too low before having a clear path to the runway. 40 years, 9000 hours, ATP-CFIIMEI,A&P…never did a circle to land except at my home airport. Former client didn’t follow that advice and hit the mountain in the circle. I would say that most GA pilots should not do circling approaches with less than VFR minimums and none at night. Some time in the late 90’s or early 2000 American Airlines decided no more night circling approaches and had us add 1000’ and 3 miles to day circling minimums if I remember correctly, and we had GPS and glass cockpits that gave us the best situational awareness at the time. I know situational awareness can be pretty awesome today, but you still need to be well trained, current and flying a lot to be safe and comfortable flying in actual IFR and at lest yearly simulator recurrent training.